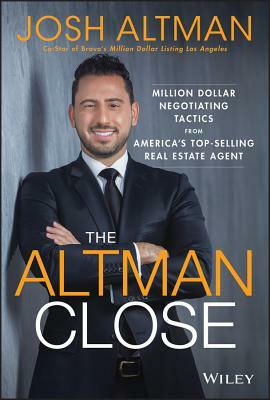 After selling over $3 Billion in real estate, including the most expensive one-bedroom house in history, Josh Altman, co-star of the hit show Million-Dollar Listing Los Angeles, wants to teach you the real estate sales and negotiation tactics that have made him one of America's top agents. Buying or selling a house, whether for a client or yourself, is one of the most important (and most stressful) deals anyone can make, demanding emotional intelligence and a solid set of negotiating skills. But by mastering the same techniques that sell multi-million-dollar homes in Bel Air and Beverly Hills, you can attract buyers and close deals on any property. Josh breaks down the art of real estate into three simple parts. First, he'll help you get business in the door during the Opening. Then he takes you step-by-step through the Work: everything between the first handshake and the last. And finally, the Close, the last step that ensures all your hard work pays off as you seal the deal. Successful real estate sales are driven by the same principles, whether they happen in the Hollywood Hills or just down the street. Josh wants to put those principles, and the techniques for applying them, in your hands. Learn them and discover what you can achieve. JOSH ALTMAN is the co-star of the hit reality TV show Million Dollar Listing Los Angeles. He is one of the most successful real estate agents in the United States, specializing in the luxury housing markets of Beverly Hills, Bel Air, and the Hollywood Hills. With his older brother Matt, Josh created the Altman Brothers, a one-stop real estate firm that provides buyers and sellers with exclusive white-glove, VIP treatment.